Valentine's Day is approaching! Perfect gift idea -silver jewellery from my antenatal group friend. Many moons ago when the idea of having seven children would have made me laugh hysterically I attended my first antenatal class filled with dreams of learning how to guarantee a natural, fulfilling and enjoyable birth experience. The actual birth of my firstborn was none of the above. For the sake of those readers who have not yet learned that no amount of raspberry leaf tea, whale music and aromatherapy will make a darned bit of difference in most labours if Mother Nature has it in for you, I will gloss over the detail of my emergency C-section. Suffice it to say what I got from my antenatal classes was a false sense of security about the delivery, no real idea of what to expect after the birth and a slight suspicion of health visitors. I did however make some flipping great mates, three of whom I still see very regularly even though our boys have all grown taller than us. I don't mention them much because they are very private people and would not appreciate being blogged about generally. One of these friends, Caroline (who now has three children) has recently started a new business making simply gorgeous jewellery and I was so impressed by her talent I offered to share details of her new venture with you lovely people. 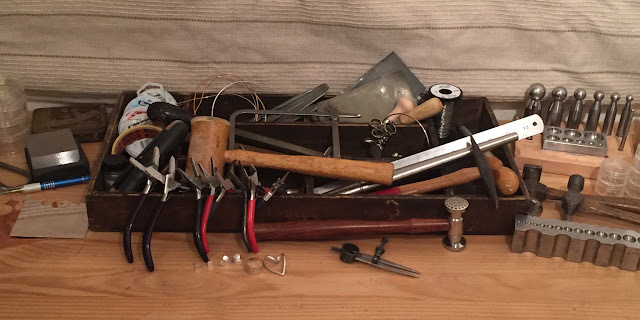 I asked her to write a little about how she came to jewellery making. This is what she sent to me. "I studied graphic design specialising in illustration at Amersham College in the early 1980's. After a short spell in advertising I went on to work for ITN as a news and current affairs designer just catching the end of the cardboard and Letraset era before moving over to computer graphics. After a few years at ITN I decided to go freelance and work for a wide variety of companies including the BBC, Channel 4, ITV, and Formula 1 to name a few. As the home commitments grew with my growing family I moved more into print, web design and training, working from home. I've always like to create physical pieces of artwork as well as the electronic side of things, mosaics and furniture painting as well as art canvases, so when my middle son Charlie returned from his gap year trip to India with a new business venture selling handmade silver gemstone jewellery, I was keen to find out a bit more about how silver jewellery was made. It was always something I fancied having a go at but thought it would far too difficult! We both went along to a contemporary silver jewellery class at the wonderful Queens Park Centre in Aylesbury. Susie Upstone my tutor has really inspired me and I haven't look back since then. I now have my own hallmark for my silver and I'm gradually building up stock on my Etsy Shop, NotionJewelleryShop and booking up fairs. Charlie my son is still running his business, Henith Jewellery, also on Etsy. His jewellery is very different to mine focusing mainly on beautiful gemstones set in silver. I now have a wonderful garden studio thanks to my clever husband's diy skills. My style is constantly evolving and growing but essentially I like clean, simple wearable designs." Now I am a sucker for anything heart shaped and amongst her designs Caroline has created a fabulous range of pieces featuring hearts perfect for Valentine's Day. 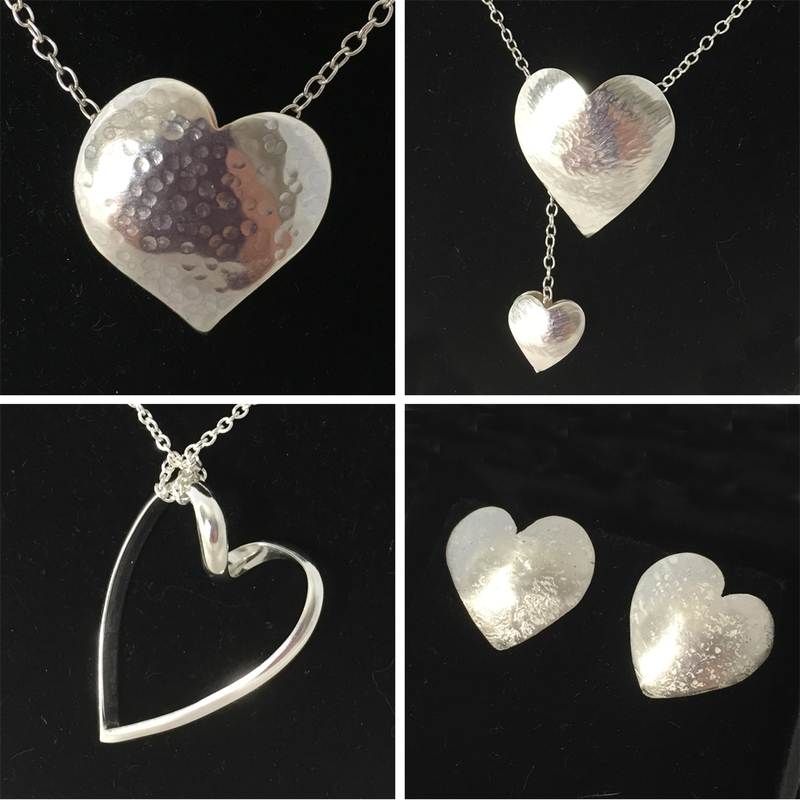 I've also put my order in for a necklace for our upcoming Silver Wedding Anniversary -Caroline has her own hallmark and I love the idea of wearing something in silver made by someone who has been such a big part of my life throughout most of our marriage. Hopefully some of you will spot something you would love and cherish too from her collection too. If silver hearts aren't your thing (if not, what's wrong with you?) never fear- she has a range of styles including bead necklaces and beautiful rings. Go and check out her Etsy store or find and follow her on Instagram to see new designs as she creates them. Disclaimer: I'm not being paid to promote my friend.